I put flour in the basement and next day, tiny foot prints appeared. My dog started to bark at the basement door and nothing was there. Perhaps a brownie lives down their. I found three four - leaf clovers in my backyard but they didn't survive for pictures. But there may be leprechauns in the area. Two of my father's shirts got ripped in the same spot and same day. I put some honey and crackers out in my room and the next day it was half way gone. Maybe a brownie came for a midnight snack. I saw a pile of rocks and on New Years day, they where in a circle around my tree the next day. One of my dad's shirts ripped, (again) in the same spot as the last two times. While I was shoveling the snow I heard two girls laughing and screaming. I looked around ever where around my neighborhood but no one was outside. I heard a dog barking as soon as I got my Spiderwick books out but I saw nothing. I put my Spiderwick books back inside and the barking stopped. My mom told me while I was at school she heard noises from the basement like someone drilling on the wall. A sign of a Knocker. I heard a loud sound like someone dropped something really heavy in my brothers room. No one heard it except my dogs and I. When ever I take my dog outside, she seems to always be scared outside of something. Early this morning around 6:40 am. I heard the slightest faint voice of a little girl, or maybe more than one, but they were screaming. All I could make out was, "Help us we're trapped!" Last night I was at a friend's house when I went out side in the dark. I lost my compass so I was trying to find it in the snow. I used my flashlight when all of a sudden I heard a rustling sound in the leaves and the trees. In the area are coyotes but what I heard wasn't a coyote. Maybe pixie activity. Last night, I put my glasses on my desk when I woke up they were on the ground. Boggarts are possible suspects. Yesterday I heard a knock. It sounded really hard but we have no clue where it came from. We checked outside but it didn't show any evidence of a human. Right away I went to my basement. I didn't see anything but I saw boxes piled on top of each other next to the wall. I thought it might be a knocker because later that day some of my enemies came to my house. I thought it as a knocker because knockers warn you of things. Today my brother told me that my Spiderwick circle of rocks was messed up after he went down there a few days ago. Then today when we went down there, it was perfect, every rock in it's place. Yesterday I looked around to see if anything happened about the world's colliding and I didn't see anything. But at night today, my detective crew came over and we saw my automatic lights in my backyard turn on. We were scared so we didn't go outside. But we tried to see if we could see anything. It stormed that night so it was windy, which ruined the part for looking for any movement in the grass. Today I went to see if my Spiderwick rocks were fine and I found out some of this bird's nest was in the center of it. After removing the nest, I saw my Circle of Rocks were ruined! I figured it might be a crows nest and they did it on purpose. Maybe Mulgulrath. Today I was in my room reading and researching about my favorite place in the world, Ireland! Once I found out Waterford Crystal was from Ireland I put my grandmother's Waterford ornament out on my desk. A little bit later, my door opened!!! It was completely closed before and my brother and mom, and dogs were outside!!! What could it be??? If you have any idea please comment on my comment page! Today my friend was over and we were playing with some of my stuff. When she had to leave, we started picking things up. Then on the ground I saw my grandmother's ring on the floor. My mom said she had it in her jewelry box in her room! Which is across the hall!!! My mom said it might be a ghost, but I think it may be a magical creature. Today one of my Spiderwick members, Emma, told me when she got home from a trip, there was a dead bird in her driveway and a dead bird in her neighbors backyard. She thinks it might be a hobgoblin but wouldn't the hobgoblin finish his meal??? I think someone or something scared the hobgoblin away. Maybe a real goblin or beast! Okay so many of you that visit Amy's site are wondering, "When is war?" Well I'm afraid I do not know. It is possible it just started in America and I am sorry I didn't get to check those last few days. Now I will make sure I will check this site and her's everyday. But I am sorry about what happened. Also if the war started in America already, it's going to take awhile to spread across the whole country. And once again if it did start, they would probably start in one of our most busiest cities, New York. I will be prepared and I hope you will too, I will practice with my arrow. I was researching about the eclipse, and I found out their was an eclipse that was clearly visible from Chile in the middle of the day, it turns out, people in America weren't capable of seeing it. It's possible that a war might not start so soon in America after all. Today a Spiderwick member, Emma, told me that this morning when she was riding her bike, she saw two orange petals floating around each other. And she said their was no wind at all and I was outside and she was right there was no wind. Anyway, the petals were moving and twirling around a stump of an oak tree. And she rode her bike past the petals and they fell. When she got up from her crash, she looked everywhere for the petals but their weren't there. A possible creature would be a sprite and they could of been using the petals as a cape or something. Yesterday Emma, told me about some more experiences she had from the questions I gave her. She said that her parents have these old newspapers behind the couch and throw back newspapers when they're finished with them and that they really don't care for them. Well, she said her parents never clean it out and one day she saw all the newspapers gone! She says her parents NEVER do anything with it but really don't care for it. A another sign of a brownie. Emma is probably going to be the member with the most experiences since her house is pretty old. She also says things move in the corner of her eye and that happens to me too, her walls make sounds like somethings in them, and she has an oak tree in her front and backyard, which magical creatures really like! Magical creature love to be by oak, ash, or thorn trees of any kind. Last night I had a dream about the eclipse and the world's colliding. This is what happened in the dream... I was going to this parlor or diner type place with some celebrities. While I was outside the shop, I saw the eclipse coming over the sky and coming close to the sun. Then I went inside and sat in a booth and my celebrity friends sat across the table. Then the eclipse was full and covered. It was longer than usual, so I thought something bad was going to happen. I was right and the ground started shaking wildly and I woke up from the dream. I didn't put my field guide under my pillow because I didn't know. I will for know on. Okay I got a few more things for my leprechaun trap and everyone that visits this site, daily or often, you can ask if you want me to tell you how to make this leprechaun trap after I'm down building it. (It should be soon, as soon as I find two large boxes, for the trap!) I also need to find tiny little miniature shoes. This trap, is going to look like an Irish cottage on the outside and inside, until he falls in the trap! Alright to get the story started, yesterday my cousins came over for a barbeque. I have two cousins, Claire and Justin, Claire is 9 and Justin is 6. My brother and I like being with our cousins, (sometimes). Well since they were over we made a fort in my bedroom since there was a thunderstorm. We sat there with the lights out, (by the way since we turned off the lights and had the door closed we didn't realized that the electricity actually did go out for a few minutes!!!) but we were playing a game with our flashlights. When we were finished Claire and I asked my parents if Claire and Justin could stay and that we had clothes that didn't fit my brother and I anymore so they could wear it without going home (which is a long trip, 45 minutes). My mom said yes and so did my dad. Then we practically begged my aunt to let her and Justin to stay. When she agreed we all got into our pajamas and Claire in I went into the fort to lay down with my dog, while Justin and my brother went into my brother's room for another round of bedroom baseball. Finally my cousin and brother fell asleep and my Claire and I talked. When I saw her eyes getting heavy, I turned on the TV and went to my bed and we fell asleep. The next morning we got up all about the same time and ate breakfast. My mom saw my dog chewing on something and picked it up. It was something like stone. She had no idea where it came from and no one else did. Also when everyone was eating and we were quite. We heard something fall. We didn't know where that came from either!!! We thought it either came from my parents room, their closet, their bathroom, our bathroom, my room, or my brother's room. I thought straight away that it might be a brownie or at least a boggart since we had family over yesterday and he was mad. But we didn't find any evidence of anything broken or of anything that fell. Okay so I just started making my leprechaun trap and it going pretty well. I still need to find a few things but I have until March so I think it will be pretty good and finished by then. Also I didn't have time so I'm writing this now, a few days ago I was in my house on the computer. My family was outside and it was blazing hot so I choose to stay inside. My dogs were tried and were sleeping next to my feet. All of a sudden, I heard something. I knew it was coming from behind me. I froze. I was completely scared. So I slowly turned around in the spinning chair, and I saw nothing. I thought I was just hearing things so I turned around and went back to the computer. Then at least a minute or two later, I hear another sound. This time it sounded like a floorboard, or something dropped. I really can't explain it. I've heard what would sound like a brownie in the wall because I've heard my brother's dwarf hamster before. But this time it didn't sound like that. But as soon as I heard it, I looked at my dogs. They both kind of perked up because they heard it to. Good, I wasn't going nuts. But then I heard it once again and I went to see what happened. My dog came with me and we couldn't find anything that might of caused it. I still don't know. But my dog was sniffing the door way to my parents room. Maybe that's where it came from. Yesterday I went to Daniel Boone's home. A historic site about a pioneer that lived there. Well anyway I remember when I was in 3rd grade, I went there for a field trip. Daniel Boone's kitchen is in the basement and that was also the last room we went into. Well when I was in 3rd grade there was this cone made of brown sugar on the dining table to show how they got brown sugar, long story, well I asked my tour guide what happened and I remembered seeing it. He told me mice ate it and they somehow got in. Remember this house is about 200 years old, so I'm guessing it might not of been mice that got into it, a brownie that takes care of this historic structure. A few days ago my dogs started barking at my basement stairs. Well not really the stairs but the wall. So I have a feeling there might be something in the wall either mice or something else. In Autumn, I'm going to my neighbors country house, in the nature and open air so I have a feeling I might be able to see something while I'm there. I just started school today so I'm going to see if I can find anything strange because it's old. Supposedly someone died there so there might be ghost which still are included in Spiderwick also there might be a brownie. One of my member just told me that she had nightmares about goblins and other horrid monsters. She said she didn't have them for a long time now so I'm guessing it's because the portal is now closed. Well if goblins were around at that time, how come nothing bad happened or weird? They didn't even try to get the book, then again my house is protected by the protective circle, well not exactly but I put salt around my house. And I am the only one with a field guide in my crew. Today at school, I was in the gym and I was listening the teacher tell the class what we were going to do today, when I got distracted by this noise. It didn't look like anyone noticed but I heard something that sounded like crawling of a little creature in the air vent or walls, I couldn't tell. But it went on for awhile then it started to sound like it was moving farther and farther. Then it finally stopped. I thought it was a brownie at first but I thought again and I thought a brownie wouldn't be that loud. So I guessed it might of been a brownie, pixie, or something else Arthur Spiderwick might not of discovered. OH NO! Okay well last night my dog was barking at the wall and would not stop. I moved the speaker from the TV and looked. I didn't see nothing but then again there might of been something there. He kept barking so I sat there with him waiting for something. I saw him moving his head, like the thing he was chasing whatever was moving. I looked on the ground and I swear I saw a footprint. It was indented in the carpet so it was hard to tell. It was about 1 1/2 inches to 2 inches long. I couldn't believe my eyes! I have a strong belief that there is brownie living in my home. Also I was talking to my member on the phone when she told me she just had a dream last night that she was in these dark woods alone, and a monster (either a ogre or goblin) came up from behind her and almost attacked. But she suddenly woke up. I don't know about if you have a nightmare of a goblin it's most likely there is one near. I am guessing, I don't know if it's true, but when Amy closed the portals, but before when it was open the goblins may have came in and now they are waiting for us. She did say she had a dream they were trying to get her, maybe they did know she was about to close it. I am not for sure but that's what I think. Also, I might of lost another member because she is getting on the curious side and is questioning it. I guess she is in the middle. I have a feeling she will stop believing. She can't tell if she will believe in it or not. Sorry I haven't been on in awhile but while I wasn't editing this site or adding new entries, I have had experiences. I haven't had time to write about them and I don't have the best memory, so I forgot a few. But I do remember I was at the bus stop one day and in the corner of my eye I saw something small and white cross by. Well you may say you think it was a bunny or rabbit but I turned around and I saw nothing, at all but grass. Also recently I found a HUGE spiderweb at the bottom of my basketball hoop. I took a few pictures and I will post them soon, but I don't think they mean anything. I would of took a closer look but there was a huge spider right by it and I'm sad to say, but I am deathly afraid of spiders. Today I went to a park with my brother's friends so they could play baseball. My dad went too and took my dog. But when Zoe and I where setting up to play capture the flag, these dragonflies kept following us and they were really big. I don't know why but I had a strange feeling there was something on their backs. I didn't get a closer look because when I got closer, the dragonflies would just fly away. I would also like to mention, Friday I went to someone's house for a party for Church. There was this huge tree and it had a hole at the bottom. I kept observing it but my friends where trying to drag me away. I wish I had more to to examine it because I had a strong feeling their might of been a pixie or faerie living in it. I am also going to my neighbors farm soon for a bonfire and they are inviting a few neighbors. It's pretty far away but I really want to go. Hopefully it will be pretty busy so I can sneak away to see if I can see anything with Spiderwick. Lately I just had this dream where I captured this faerie and I said I would let it go if I could get the Sight or for it to help me look for a Seeing Stone. I would never do something like that! I can't believe I had a dream about it. Today my lights went out for awhile and it was a really nice day out, it was about a minute and I heard a huge pound on the wall. No one in my family heard it and we where all in the same room! I just noticed something pretty freaky last night when I was reviewing the guide. Yesterday, exactly 75 years ago, Arthur Spiderwick went missing! Now that is pretty freaky! But also remember in my previous observation where I talked about dragonflies? 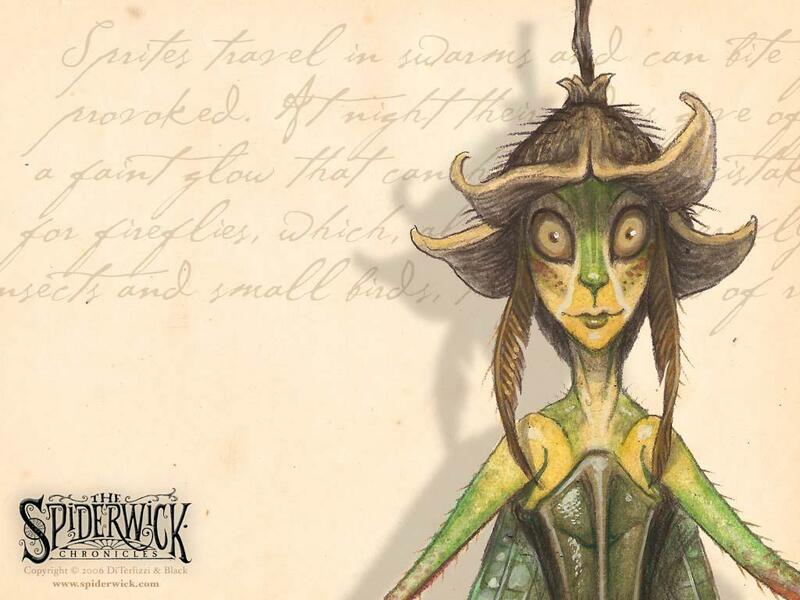 Well I read a little bit about pixies, and it said that when Arthur Spiderwick was observing a pixie dancing in the meadow, she turned into a dragonfly. The park I went to has a big pond, most of it is meadow, and there are woods near it. I have to go or else I would type more, sorry! Okay I just saw something weird about 3 hours ago. I was going outside because I wanted to see what my brother was up to. When I glanced down the street to a house that belongs to a firefighter, I saw something move. They have these huge tropical plants that have really big leaves. I saw a shadow I think, move across to another, it looked like a human figure well sort of. I looked back and it was gone or hidden I don't know what it was but it was pretty creepy. Okay I forgot to tell you but when I was reviewing the guide, I flipped to the Phooka page. I saw a blackberry on the page so I read about it. It said Arthur Spiderwick found blackberries where he found a talking horse! But before I knew that, I went to my neighbors garden and picked blackberries for them while they were gone. I love doing that stuff because I love farms and anything to do with them! I love nature basically. But I took pictures of the blackberries before I gave it to my neighbors because I thought it was cool. After I found about what Arthur Spiderwick discovered, I posted the picture of the blackberries on my Photos page. Also I might not be able to add more photos for awhile. Because to add more space for it, I have to pay $14 a year. And my website name might change. A few weeks ago I went out to eat. When I was walking out of the restaurant, I saw a huge black crow on the street light. It was pretty creepy because it kept looking in our direction. If kept crowing and staring at our every movement. It just freaked my out so much I tried my best not to look at it, but when I did glance at it every so often, I thought I saw yellow eyes. I couldn't tell and I didn't want to keep looking at it. Also after I was reading something today, I remembered that Phooka's stay in trees a lot, well when I was younger and after I moved into our new house, there used to be an old dead tree in our neighbors backyard. Sometimes my family and I used to look at it and see something big, furry, and black. It had yellow eyes and looked like a cat but bigger. Sometimes we thought it was an owl. Now since I know about Spiderwick, I am thinking it was a Phooka. I know this might sound funny, but I always "lose" my remote to my television in my room. Every night I have it on my nightstand to turn it off, but about a week ago I lost it. It wasn't the first time, I looked all around my room for it and couldn't find it. Then one day I went to my parents bedroom to go get my dog, when my mom said, "Do you know whose remote this is?" I told her it was mine and that I had no idea how my remote got to her room. Right away I thought it must of been a brownie! Today I had to stay after school for the school play rehearsal. I had to stay until 5:00PM. Where the classroom is, is around the Art room, Band room, Choir room, Music/Keyboard room, Woodshop Room, etc. Well during rehearsals when only two people were on stage, I heard a drum. It was only once, that I know of. No one else was in the same hallway, everyone else that stayed after school was on the other side of the school. And everyone at rehearsal was in the same room. So I have no clue how I could have heard a drum because all the teachers was gone too. So I guessed it must of been a creature. Also my school is said to be haunted, then again what people said, could have been mistaken for Spiderwick creature. Amy told me it might of been a hobgoblin or a boggart. If it was a boggart it is probably because we were very loud!! Yesterday I went for a walk in my neighborhood. When I got to the end of the sidewalk, I heard this wailing, or it was crying, or it was whimpering. I could explain the sound it also might of when moaning. But then again, Halloween is coming soon so it is possible it was a yard decoration. But when I got closer, it kind of just stopped. If it wasn't a Halloween decoration, what could it possibly be? And if it was a creature from the Invisible World, what was it? Yesterday I was walking to my bus stop for the school bus, when my one of my neighbor's tree started shaking wildly, but it was only one branch. At first I thought it was a bird, but I realized I've seen birds before on that branch and it never shook that bad. Then I thought it was a hobgoblin even though I couldn't see anything. Then a bird few out of the tree, and the bird was a black crow! Then the crow went down the street on someones house and kept crowing. Then finally three crows started heading west and another bird joined. While the three crows just kept on crowing. I don't know if this meant anything because I didn't get a look at the crows eyes. But I thought it might. Wednesday, when I was playing soccer at school I heard the same call I heard the day before. Three black crows. They were circling something near a house. These crows kept doing it for a few seconds, until finally they stopped in flew away. I tried to ignore it, but I couldn't get it off my mind. I probably wouldn't have seen it if I wasn't the goalie, which practically means I just stood there the whole time. But the weird part of it is, the day before three black crows where near me too! This morning I was in my garage waiting for the bus. I heard this small noise and I thought it came from the side of my house. I asked my mom if she heard it and she told me to check the side of the house. I went to look and I saw what looked like a path of dead grass that led to this circle of rocks I made for Spiderwick and my four-leaf clovers. The rocks where messed up and I was pretty sure it was in order a few days ago. And we haven't had any strong winds recently. I wonder if it was a creature and tonight if I have time, I will check the Field Guide. I told my mom I saw nothing and I guess she ignored it. 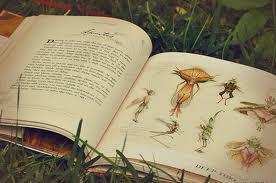 Today I got a book and I just started reading it, it's just like Spiderwick. But of course they are things that are different. It talks about faeries, changelings, and all those other creatures. I think it's good but in the beginning it's pretty sad. Well to get to my experience, just before I typed this, I was outside just looking for rocks to keep. Then I noticed there was loose dirt, a sign of faerie activity. It was next to the side of my house, the same side I heard the noise, and I noticed there were rocks covering something. I started to dig with my foot but since I didn't get much progress I started to dig with my hands. I got pretty far and removed the large stones that were in the way. I kept dig and I noticed it went even farther. I stopped there when I noticed it was a hole as big as 5 to 7 inches in diameter. I wanted to go farther but was afraid something such as a snake would pop up at me. I covered the hole back up with only the large stones on top. I will check back tomorrow. P.S. my brother is having one of his friends over tomorrow. He is very Irish and believes in leprechauns as much as I do! The only problem is, is that he is very religious so he might not believe in Spiderwick. Today I went to a Fall Carnival for my old school. When we parked our car, an acorn dropped on the roof of the car. The only reason I am typing this is because I was reading the Spiderwick Field Guide and it said pixies are usually the reason acorns fall on people or things. Also the weird part is, is that the acorn fell right before I got out of the car. Okay last night I was getting kind of freaked out from horror films that was on for a Halloween marathon. To get the the point is my brother had a friend over last night and most of us couldn't get to sleep since we kept hearing stuff. For example, my brother's friend was telling me this morning that in the middle of the night he kept waking up to the sound of pounding and creaks. He told me he went to the fourth step on my stairs to the basement and he thought he heard something downstairs. My basement is not finished so all is has is a bunch of old boxes, furniture, and workout equipment. Also I remember waking up around 6:00am this morning and waking my brother up. We stayed up for awhile and watched TV. About 15 minutes later I heard this loud pounding sound! It was pretty creepy because my father and mother were asleep and my brother's friend was right there by us in the living room asleep. I asked my brother if he heard it and he refused. I fell asleep and didn't wake up for another two hours. But I do recalling around midnight my brother waking up claiming serious pain in his right arm. Maybe a boggart. I think. Yesterday I went to my neighbors house to hang out. Well she wasn't outside and she wouldn't answer her phone. So I rode my bike down her street and asked one of my friends which was outside if Paige was outside. He said no and he was talking to a different neighbor. So he asked me if I wanted him to go up to the door and I said yes. So we turned around to start walking to her house, when in mid-air a leave was twirling and it looked like it was dancing. Then it slowly fell to the ground and landed there. I didn't pick it up but I should have. Also I was reading one of Amy's last posts and it talked about her being bit by a spider. Something so similar like that happened to one of my friends about two weeks ago. She told me she woke up and her left wrist started itching and she looked at it. There were two hole which looked like bite marks. Except the bite mark looked a little bit bigger than to be a spider. Just today she showed me where it happened and it is still there! It looks like two little red marks but you can tell it pierced the skin. Sorry it's been awhile since I was on but the day of my last post, (November 4th,) something strange happened later that day. I was on the computer with the volume off, and my mom was folding laundry. Our two dogs were next to her and my brother was gone at a friend's house. Plus my dad was gone, he was at a hockey game. Well to get to the point my mom and I were alone and none of the TV's were on. But we heard something. It sounded like it came from the kitchen. My mom thought it was a 2-liter of soda falling and rolling around. But I thought it was my dog's bone sliding across the kitchen floor. Then when we were both shocked I stood by her and we heard something else and it sounded like it came from the hallway, but I don't know how to describe it. Also I remember when I was little I was sitting on my bed playing we a stuffed turtle. I must have been 4 or 5 at the time. My doll was behind me when I felt something on my back. I was so scared I turned around and nothing was there. It felt like a really small light tap. Since I was shocked I just tried to make myself believe it was my doll falling on my back, even though it wasn't. I can't believe I'm remembering so much of my past, but I also remember when I was a bit younger I kept hearing things at night. Since my kitchen chairs are kind of old and are made of wood, if you sit on them they creak. Well in the middle of the night I could hear chairs creaking and I would have no clue what it was since everyone was asleep. Also I think about a year ago or the beginning of this year, they was this sound coming from my parents room. It was a high pitched sound and it happened almost every night. And it would continue for awhile each night. Finally it stopped but whenever we heard it and tried to find out what it was, we never could find the real reason. Plus, when I was 5 and I was new to this house I would always hear a beeping sound, it sounded like a bomb. And I was so freaked out I woke up my dad and as soon as he woke up, it stopped! Another time I woke up and couldn't get to sleep so I wanted my dog to lay with me. I went to get her a treat and used my brother's hat light attached to my hat and went out to the kitchen to go get it. Well my dog followed me so I tip-toed there. I was always scared of the basement and still am. I'm always afraid something is down there. Well when I was getting the treat I kept looking back and forth between my dog and the stairs to the basement. Finally when I just had the treat in my hand, I looked down at the basement door which was open and saw a black figure dart across to the other side. I was so scared and panicked running toward the hallway screaming, "Robber! Robber!" My dad was walking out of the hallway because he heard me in the kitchen. I told him what I saw. He went to the basement and found nothing not even a way to break in. I told him I saw what I saw and I believed what I saw. He told me I was just seeing things and my eyes were playing tricks, but I don't believe that is the answer! Yesterday and today, there have been things all over my house that have been missing. But then again they could have been misplaced. When I got home from school my mom was wondering where this bottle was because she was cleaning the house and she needed it for the restrooms. Well she was looking everywhere and checked every possible place if probably could be. She couldn't find it so then she tried to look for a dust pan and again couldn't find it! And I remember yesterday my family and I were trying to look for the top of the blender and still wasn't able to find it. But my mom cleaned out the back of the cabinets and there it was! In the very back! We didn't understand why it was back there. Suddenly I thought it was a boggart but then again, why would he/she need it? I didn't say anything. I know it sounds weird with random stuff disappearing but it just feels like it would be a brownie or boggart. Since my mom is very well organized. Plus, last year we were trying to find our pizza cutter but couldn't find it. To this day, we still don't know were it is. The answer is possibly a brownie or boggart. Today I was out in the snow since it is the first snow this year, and I was in the driveway. I was trying to get snow in my sled to put it in the yard. But then I heard a noise like something fell in my garage. I stood up and looked. I saw nothing but then I saw a reflection in my mother's car, and I saw a black figure go past in the street in the reflection. I turned around and didn't see anything, anything at all just the white hills and houses of my neighborhood. Then later after that happened I was still trying to get snow out of my sled instead. Then I saw this man, I couldn't see his face but it was scary. He was in a light brown, like a tan, snow suit, with a black hood and a light blue bandanna around his face. He was walking in the middle of the street and a car went by slowly like the driver was as confused as I was. He walked down the street but still visible. He went into someones yard and I think he looked back at me and I looked down. But I looked right back up and he was gone! I was really freaked out and I stood there a little bit longer. Scared and kept thinking he was going to come back. So I went inside. It is really windy so the snow must have covered his tracks plus cars that go back and forth. Also I remember, a few days ago my dog was barking at the same spot he barked at last time, (the time I thought I saw a footprint). He was like following something. He first was on the couch and then he got down and started barking in mid air. I thought I saw another footprint but then I thought my eyes were playing tricks. I now remember my dad and I waking up at 3 a.m. to find my dog barking on the couch once again at mid air. Probably a pixie or brownie! Okay last night, (Christmas Eve), I tried to post this but I couldn't because it didn't save. Well last night my dog was barking at the stairs to the basement. Both of my dogs bark at it all the time! I looked down to the door to the basement to see if I could see anything, the door was closed. The weird thing is that, the door to the basement is never closed! The lock is broken so it's always open. It was weird and all my family was upstairs doing something! Plus today, of course for Christmas, I got a box that can grow clovers. There is this booklet inside and I read a few pages. It said it the Medieval Times, kids would look for four - leaf clovers. The kids thought the four-leaf clover would let them to see faeries. And if they did find one, they would search for faeries near by. I will read more of the book and hope for more information like that! Merry Christmas, and Happy Holidays! Around 11:15pm last night, when I was getting ready to go to sleep after a long day, my dog ran out of my of my parents room and started barking. Everyone was inside their rooms so there isn't an explanation for this, well he ran all the way toward the stairs to the basement. He looked down and barked then I picked him up. If you read my early experiences you will see that my dogs do this numerous times. Plus this afternoon, I was organizing my room while listening to my iPod when I heard three knocks on my wall. I turned my iPod off to hear anything three knocks on the wall that separates my brothers room and mine. I didn't want to stand up because I was scared it would stop. Then the knocking began to go a little wild and didn't stop. Then after a few seconds, it stopped all by it self; out of no where. A few nights ago, my mom and I were talking about ghosts and orbs. I've never had an experience with a ghost but I have with an orb. December 27, later at night I had my cousins, Claire, and Justin, spend the night. They are the cousins that are younger and I always play with them in their basement and we look for ghosts. Except that night we were at my house, and we weren't looking for ghost. My cousin, Justin, and my brother were playing with my brothers new game called Loopz. I was bored while my other cousin, Claire, talked to my mom. So I was taking pictures. I took one picture of Justin and my brother playing Loopz and I always take doubles so I did. My camera is always clean and is very high ranked and clean. My camera is a Canon, one of the best cameras. Well when I looked at the second picture to see how it turned out, there was a white orb right behind my cousins head! Right there, as clear as day! I was really scared so I showed everyone then deleted it. It was very stupid of me to delete it but I was scared. Also I know this doesn't have anything to do with Spiderwick, but today I just experienced a tornado warning in my surrounding area. It did not hit my city, but I did get bad weather. I felt like sharing it because it's the middle of winter and it's 60 degrees Fahrenheit! (19.4 degress C.) I wanted to tell you guys because I remember this summer Amy and I talked about how our weather is crazy, well now it has lost it's mind.